Can you imagine how a spear of a big tree will look like when it has grown on a narrow pedestrian path? A tree should be in 3 dimensions. 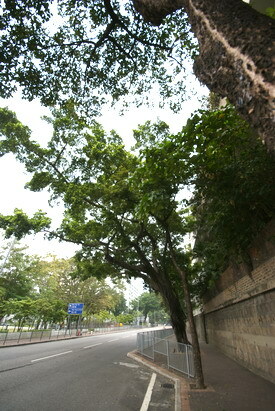 However, the two sides of tree crown face the shops and the traffic road have to be chopped down forcefully. The tree can only grow up within the 2 directions of the pedestrian path; no wonder it has finally become a 2 dimensions tree! 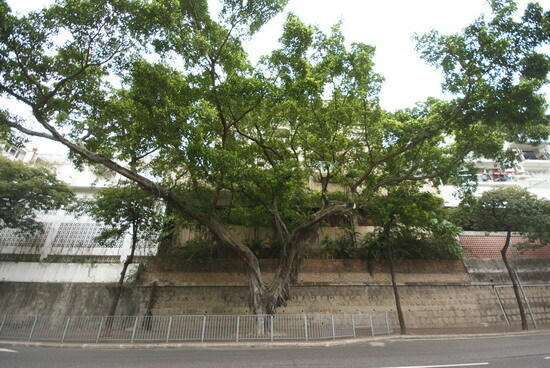 The top and the bottom left picture is a Chinese Banyan located in Tai Hang Tung Road. The tree crown is look so wide and dense when you view from the front but not from the lateral side of it. It is growing taller but flatter! Chinese Banyan has a wide-spreading crown, strong trunks are built up once its aerial roots reached the ground. It defenses itself from the weakness of easily rotten by spreading its aerial roots on the floor. But under human intervention, it lost its aerial roots and two developing sides, and its nature is violated! The bottom right picture is a Weeping Fig. 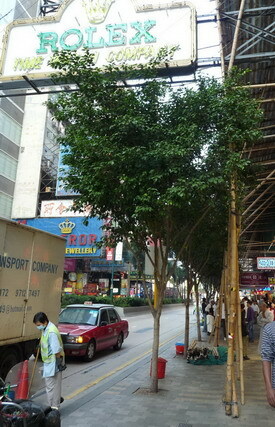 It is planted on the pedestrian path of Nathan Road because of the government green landscape program in Tsim Sha Tsui. It is unlucky because its two sides are kept cutting. The shop sign at its top has also hindered it grows. I am curious of its fate. Will the government persuade the shop owner to take away the shop sign, or just let the Weeping Fig continue to grow and pass the shop sign?